This product was added to our database on Friday 15 June 2018. 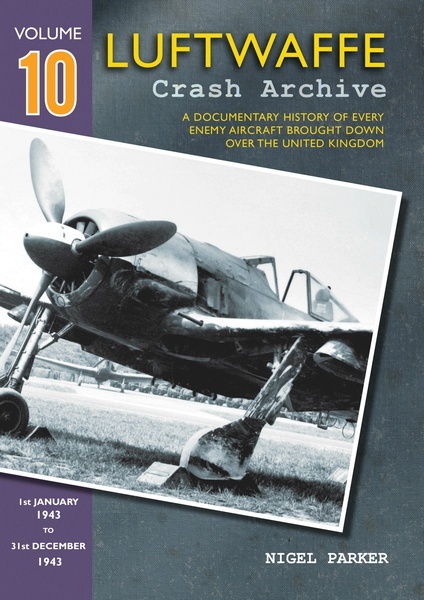 Red Kite are proud to present Volume Ten of Nigel Parker's Luftwaffe Crash Archive. Researched over twenty years, this incredible body of work brings together details from the official RAF intelligence and interrogation reports, and combines them into a definitive guide to every enemy aircraft that came down over the UK during WWII. With over 200 photos in each volume, drawn from dozens of expert sources, this lavishly illustrated series is a must for any Luftwaffe enthusiast or indeed anyone with an interest in the Air-War 1939-1945. Volume Ten covers all of 1943. This period began with sporadic raids by Ju88s and Do217s before the FW190 tip and run raids started to hit the south coast of England with increasing intensity in the summer months. The year ended with Ju188s and He177s making an appearance as the RAF night fighters continued to take their toll. This volume has the usual selection of original photos, colour profiles and specially commissioned maps to illustrate the aircraft involved.